Just thought I'd share some pics of the new cart I have made for my 2015 PA14. 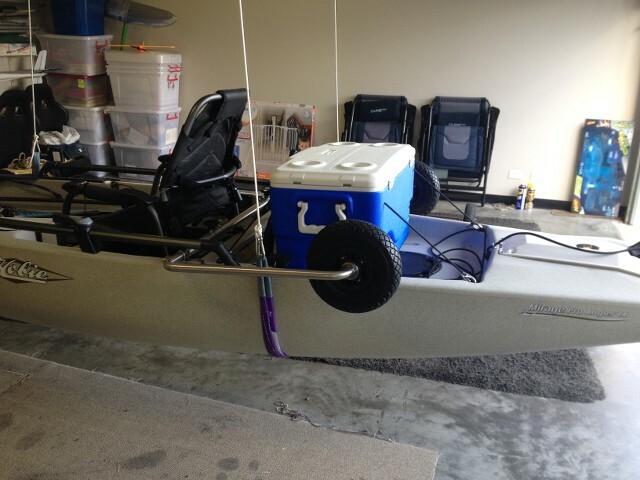 I got sick of having to empty everything from the kayak when I was finished for the day when using the heavy duty cart. So I adapted the Boonedox Landing Gear concept and produced my own from 316 marine grade stainless steel for all components. I also designed it so that I could quickly swap over the heavy duty wheels to the new Railblaza C-Tug SandTrakz wheels for beach work (haven't used yet so can't report on effectiveness). The eyebolts you see in the pics are used for extra attachment points as well as to provide a stop for inserting the arms to the correct depth. I also reinforced the arms with solid stainless steel bushes for the holes where the screw-in locking pins insert....... to prevent the holes 'flogging out'. The systems works beautifully. If I wish, I can drop the wheels down before beaching which also protects the rudder if I forget to pull it up in time. The arms float when using the heavy duty wheels but I suspect they will sink with the SandTrakz wheels fitted. 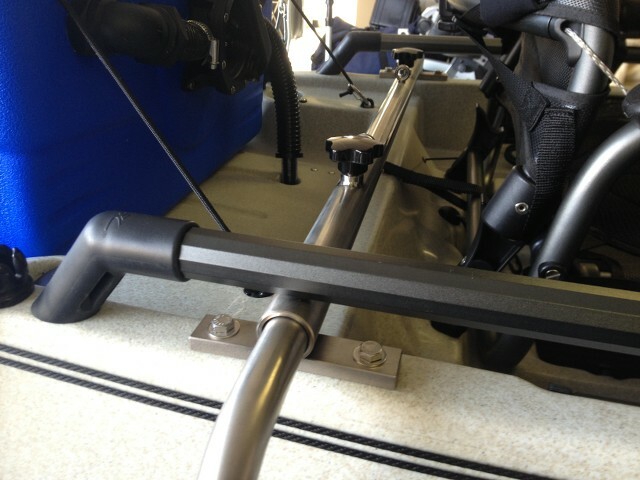 The cross member for the wheel arms is fixed internally to the kayak with 1" x 3/8" x 5" long st/st threaded plates. 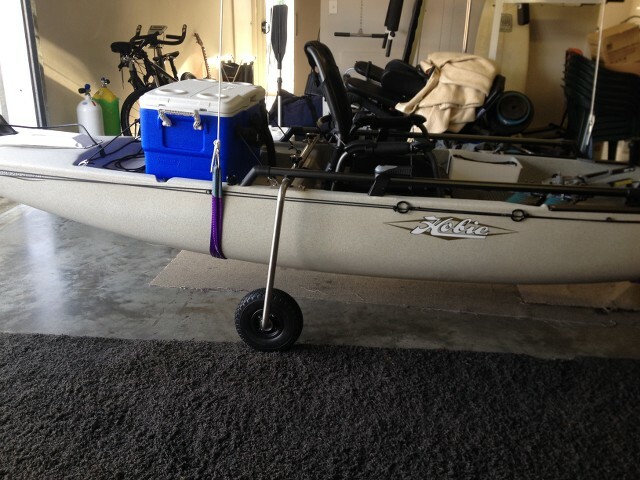 The cross member would be 1 ¼” SHS attached to the kayak the same way as in my pics. A short length of 1 1/8” SHS (which slides neatly inside the cross member) is slid over the section of arm (1” OD) that goes into the cross member (tack welded to arm). A simple drop in pin with a retaining clip would fix into position. This setup would be much easier to produce and the SHS would be more effective at handling twisting loads. 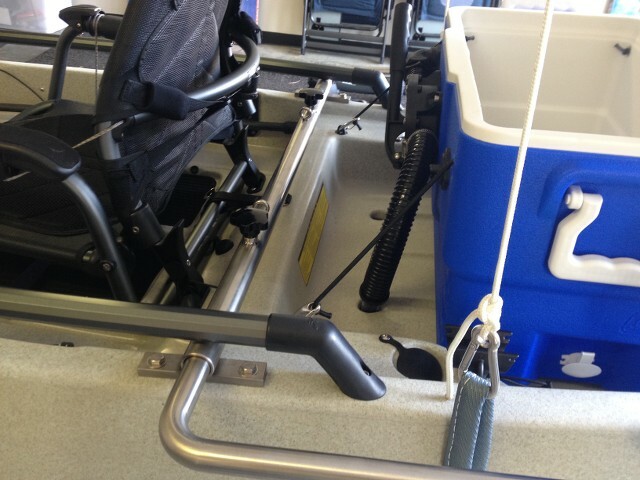 Simply pull out the arm, turn 90 degrees, re-insert and the wheels are in the paddling position. This was my preferred design but I was unable to produce it due to the sizes of stainless steel SHS required not being available in Australia. Last edited by Jbernier on Fri Aug 19, 2016 8:19 am, edited 1 time in total. Nice looking and well thought out design! 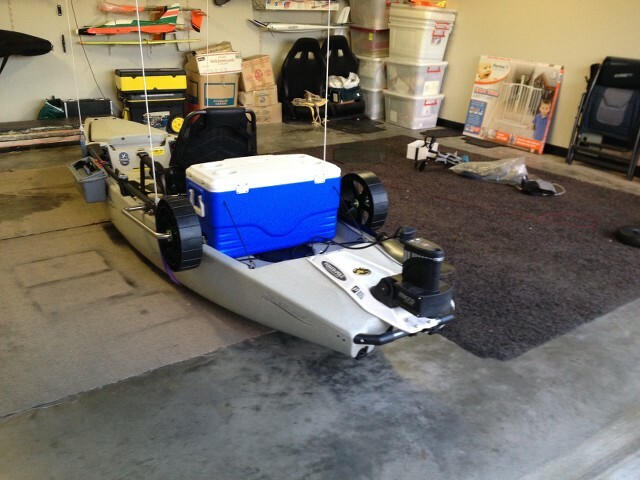 Luckily for me, I can launch and recover my PA-14 using my modified Hobie Trailex trailer. With all of the stuff I carry,( 18 amp-hours battery for my electric cannon down rigger, 4 1/4 pound down rigger weight, anchor & chain, 9 amp-hour battery for sonar/fish finder/gps combo, safety stuff, water, tackle, etc, etc) it tops out at close to 180 pounds and that's too much for this old guy to muscle around. The trailer is a life saver. 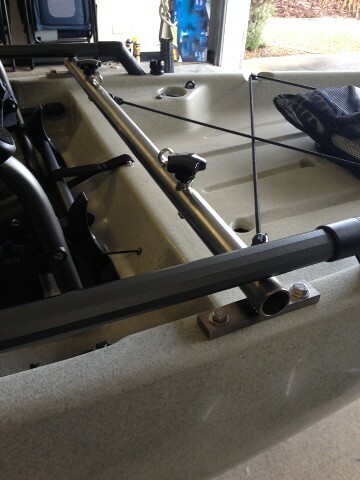 I mainly purchased the PA14 so that I could still get on the water when my wife and I go caravanning. We have a small Aliner van so can't tow a boat trailer at the same time. I'm only small (160cm / 62kg) but have found that getting the PA on the roof rack of my Toyota Rav 4 more a matter of technique rather than pure muscle. 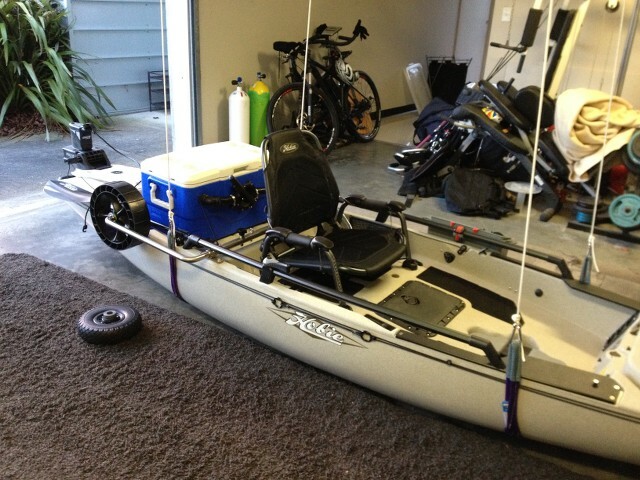 I have a small aluminium boat setup for fly fishing etc if I need to fish more than one up. However, I'm preferring to use the PA whenever possible as I love fishing out of it. 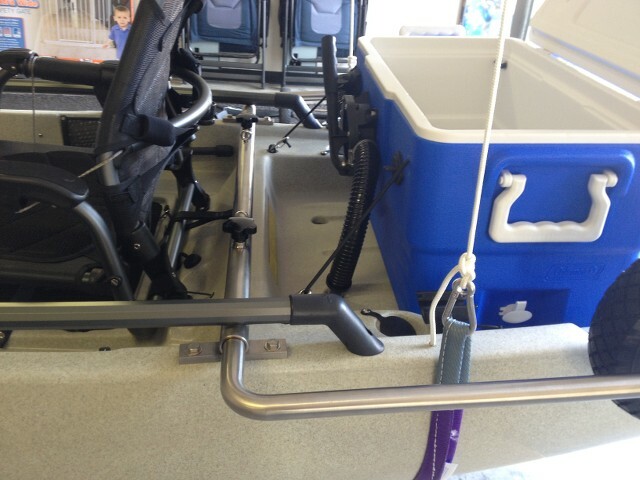 Looks to me like you could use the same setup to deploy lee boards for sailing. Just slip em over the tubing. Ive never used the kayak for sailing..........but it sounds like another option if it was needed. Nice job. I planned on buying the boonedox landing gear for my pa14 when I get it. 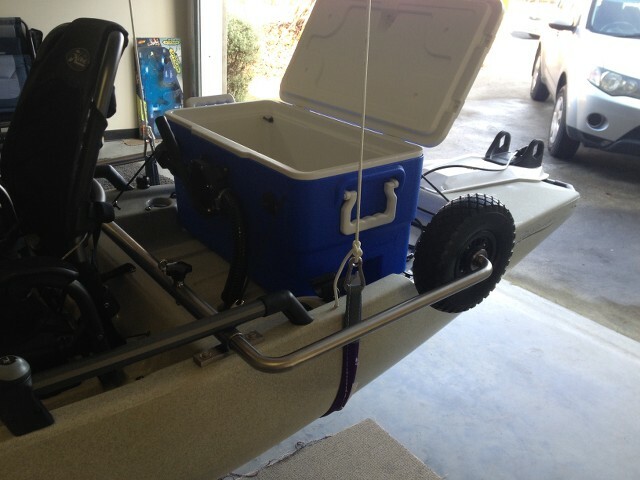 I also wanted to put one on my Coosa but don't think I could make it work directly behind my seat. Your design might actually work for me and it looks like it takes up less space. Did you bend the pipe or did you have someone do it. I wonder if an electricians pipe bender would give me that nice of a bend. I know they work well on emt but not sure about stainless. Wouldn't want to install a kinked up piece if pipe to such an nicely thought out pa14. Who says you can't rooftop a PA14 on a jeep with a 4" lift? I have a metalwork trade background (Fitter & Machinist) but didn't have access to the pipe benders required to do the bends.......so I had them done at an engineering firm. They were done on a very expensive hydraulic pipe bending machine and are as tight a bend as possible with this size pipe/tube. The pipe should never bend as the tight bends increase the structural strength. So, 5 months of using this setup has proved very successful. It works beautifully..... I love it. I doubt that anyone would ever go back to a scupper cart after using a system such as this. 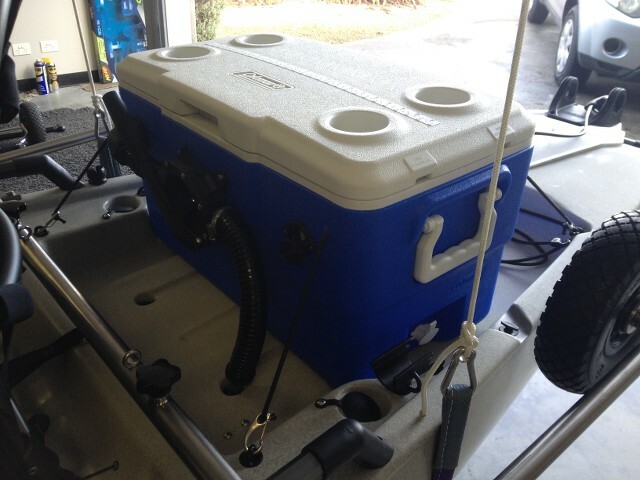 If you are a competition angler, this type of system still allows the use of a live well (or Hobie H- crate) AND power pole micro anchor. 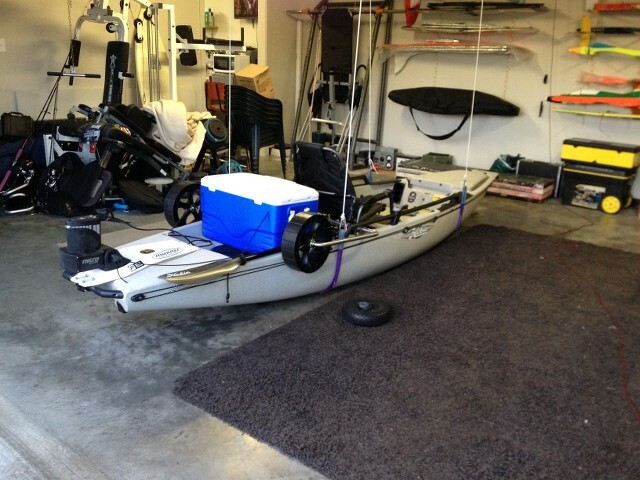 I think that Hobie should seriously consider offering a factory system such as this fitted to PA's as an option. I wonder if an electricians pipe bender would give me that nice of a bend. I know they work well on emt but not sure about stainless. Wouldn't want to install a kinked up piece if pipe to such an nicely thought out pa14. If you fill the pipe with sand before bending, it will not kink very easily. 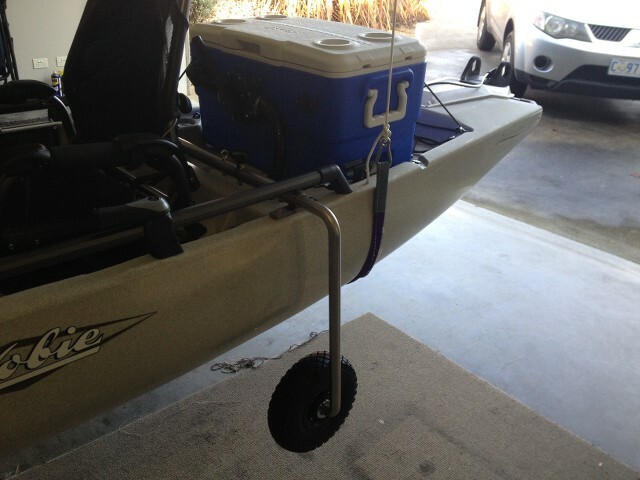 Hi I was making a wheel set up for my hobie pa .How long of a pipe did you use for the leg before bending it?